Here is a view from Chalky Mount, of Long Pond, and the Lakes Village in the foreground. 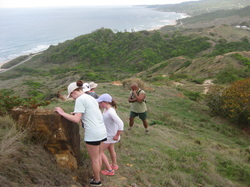 This vantage point offers a panoramic view of the rugged beauty of the 15% of Barbados, known as the Scotland District. So named because it reminded the English Settlers of the Scottish Highlands of Scotland. This hike begins at the Barclays Park on the beautifully scenic rugged East Coast of the island. Hikers walk along the crunchy brown sand, as our guides interpret the beach detritus. We also point out the head of the sleeping Chalky Mount Giant, maybe you see him in this photo. One of the highlights of this trail is a visit to the Chalky Mount Pottery, of John Springer, who is from a long line of Potters going back 200 years. In this photo John demonstrates his excellent craftsmanship, as he narrates on the various transformations of the clay. 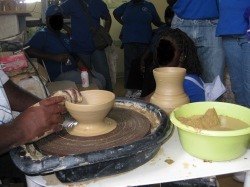 Fine 100% Barbadian clay drinking mugs, pitchers, vases, candle holders, and other clay products are available for hikers to buy on the spot. It's like magic, the metamorphosis that takes place before your eyes, as John spins a lump of clay.